PRO LINE - Larger Heating Mat (7" x 27") provides 2.5 times the heating power. Recommended for vessels larger than 2.5 gallons, or for very cold environments. 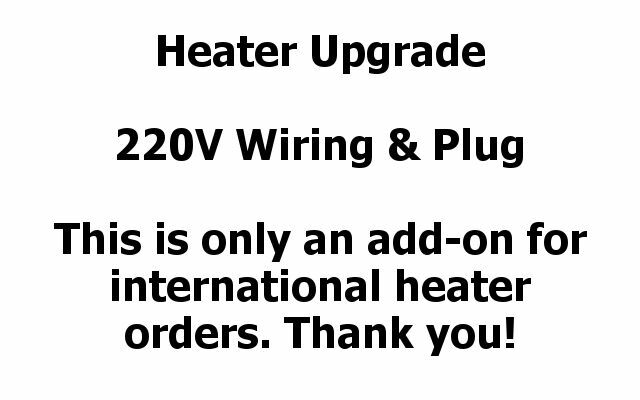 *****220V UPGRADE - NOT for North American Clients - ONLY International. If your country uses 220V wiring, you must either select this option OR locate a transformer to use this heater. ****Sorry, both options not available together. BRAND NEW PRODUCT - AVAILABLE EXCLUSIVELY AT KOMBUCHA KAMP! perfect temperature for all your home ferments! Peace of mind, ease of use and stylish design are the biggest advantages of the FERMENT FRIEND™. This easy to use thermostat controlled unit allows the user to simply “set it and forget it” as the temperature is self-regulating. Each unit is made in the USA in accordance to the strictest safety standards, and is designed to remain below 110F/43C to prevent overheating. Keep your Kombucha, kefir, dough or other ferments that require warmer temps happy year round with just the touch of a button. Once the target temperature is selected, the FERMENT FRIEND™ probe is placed between the strap and the exterior of the vessel, but not in contact with the heat mat itself. The unit maintains the target temperature within a degree of accuracy and is secured to the vessel with the included adjustable velcro strap. Seamlessly integrate the all black heater and thermostat into any environment by mounting the unit with the enclosed velcro tabs. By request, we have created a version of the heater with a larger heating surface capable of producing 2.5 times the power of our regular heaters. This 7"x27" heating mat is identical to the original model except that the increased surface area makes it suitable for 5 gallon vessels, multiple smaller vessels, or for use on a regular 2.5 gallon vessel in very cold conditions. Simply select the PRO LINE Upgrade from the drop down menu above. Want to use the heater in an international location outside North America? Looking for a larger heating mat? Unfortunately at this time, the PRO Line is not available in 220V wiring. Need a custom sized strip to fit your specific fermentation needs? Effortless. Put it on, set the temperature and leave it alone. Perfect for my busy lifestyle and travel schedule. Wow! 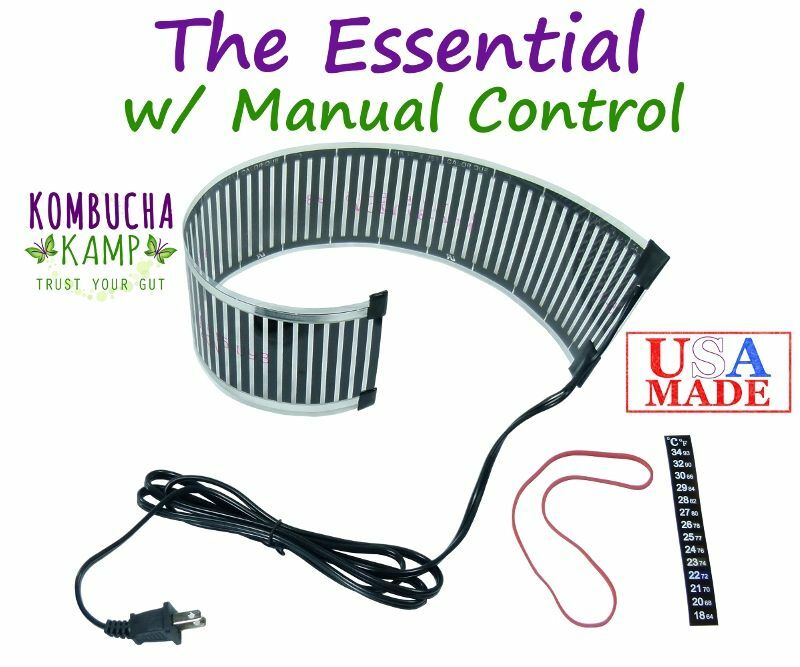 After I sent pics of my suspicious-looking kombucha to Kombucha Kamp, their support team responded immediately, identified my problem, and recommended a heater. I chose the Ferment Friend because -even though I love my kombucha - I really don't need another thing to keep track of. This heater is perfect. Temp just automatically stays where I've set it. I highly recommend this product and Kombucha Kamp. This heating pad has been a smart purchase. My kombucha has a much better carbonation now, which I like. Great Product!! We recently started our second continuous brew and so we purchased another of these. I couldn’t believe the difference in the flavor of our Kombucha with it being at a consistent temperature, we get perfect Kombucha every time! And it’s really true, we just set it and forget it! Highly recommend this heater, it’s worth every penny! Kombucha Kamp not only has what you want, they have what you need… In my case… Kombucha Heat Mats!!! I live in Wisconsin -heavy sigh. I know that my production will eventually get bigger, when that time comes, Kombucha Kamp will supply ALL my needs… to help me make that happen. So happy to have this product. Easy Set-up and consistent temperature make this a must have item for my Kombucha brew. Thanks. The ferment friend was an excellent addition and is essential to keeping my brewing vessels at the optimal temperature for a good Kombucha brew! Love this product! By Kim Humiston 12/23/18. I had tried making kombucha with another culture from elsewhere, and did not have good results. I did my homework and realized I was going to have to have a heater if I was going to be serious about making booch. This upgrade heater with thermostat holds its temperature and makes brewing easy! The Ferment Friend heater is a must if you live in a cooler climate! It's almost like brewing with your eyes closed, constant temperature makes better Buch! This heater works great! It is keeping our kombucha nice and warm. Very easy to set the temperature. I have the heater standing on it's edge between 2 1.5 gallon jars. There is enough space to also warm the scoby hotel. Very happy! Summer or winter, our house is never at the optimum temps for kombucha brewing. Now I don't have to worry about the temperature since I got the Ferment Friend for my jars. It really is a case of set it and forget it. Works great. Now I am buying a second one. It really is "set and forget." So glad I invested in this heating system. The weather has been much cooler than usual, but now I can keep brewing for myself and my friends. This thing is THE BEST! I was hesitant to take the plunge with this, but I'm so glad I did. I started brewing in April, just before it started to get warm, so the Ferment Friend saved me. I still keep it going even now because I like to keep the temperature in the house around 70. The digital control/display makes it easy to just set it and forget it. 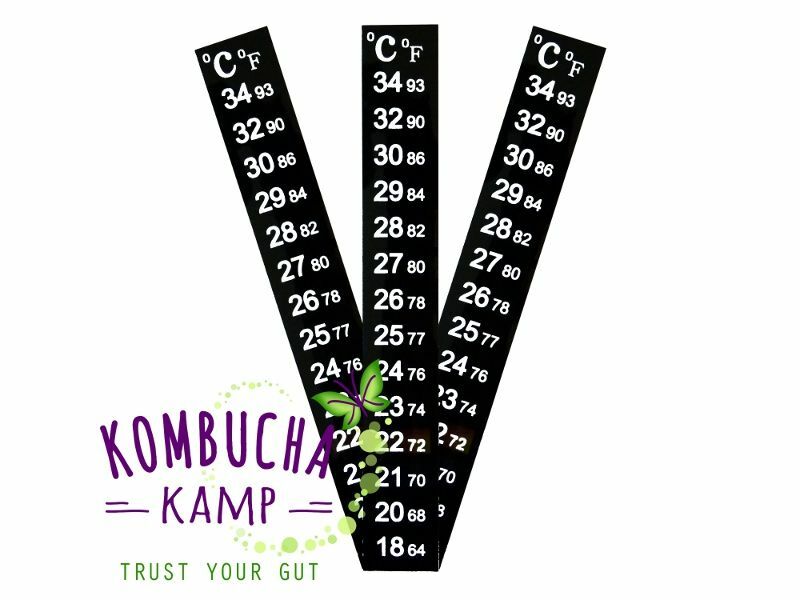 Even if you've started brewing already, it's not too late to give your booch this temperature boost! Got the Ferment Friend heating system to heat my kombucha. Started out with hot water bottles but they didn't make up for the coolness in the house. The heater keeps the brew at the correct temp now and my scoby is nice and happy at last. Love the set it and forget it settings. I purchased The Ferment Friend with thermostat control to maintain a steady temperature. While it turned out to be pretty expensive with the currency exchange difference and customs duty, I don't regret it as the heater does an amazing job of keeping the temperature pretty consistent, which I think has helped my Jun produce healthy babies especially in the cold temperatures here. Great heater as it keeps my vessel temperature within a degree. It is simple to use and well worth the money!! Great item. Worth the expense. Set it and forget it. Optimize your brewing with no added fuss. Love it. This is a wonderful heater. Set it and forget it. I live in Florida, but my husband keeps the house cold. I struggled to keep my kombucha at the right temperature, but not anymore. It was an expensive purchase for me and worth every penny, a true game changer. Quick delivery, easy set up and detailed instructions. I finally have carbonation too. I am very happy. My kombucha was not fermenting this winter, so I ordered the heater. Within a couple days I could tell the heater kicked it into gear. So easy to set it to the correct temp and not have to worry about it! I loved my heater so much and wanted to brew more kombucha, so I now have 2 heaters and love them. ​I ordered the heater strip with thermostat. I love it. The heating pad and thermostat make it so much easier to brew and keep warm as our winters get quite cold. I am so looking forward to brewing my own and having it be so easy with the heater. Great item and would definitely recommend. This was ordered in Feb last year...just what I needed!! It works great up here in the cold N. Calif. mountains!! This heating strip is really Nice. Very glad we bought this one. Like that you can adjust the amount of heat. We live near Chicago, so it's cold in the winter here plus we keep our house cooler we like it that way (hardly ever get sick) & this heater works Beautifully! I live in the Los Angeles area and I love this heating tool. I currently have three 2 gallon jars brewing and I can swerve this around in a way to have all three jars brewing at the perfect temperature. I highly recommend getting this product. As a matter of fact, I think I'm gonna order another one right now. Love you guys! I'm very, very pleased. The order was processed quickly with regular updates. The order arrived quickly and the heater works exactly as described. A great product and well worth the price. Thank you KKamp. The heater is fabulous as our house is cool all the time. It took me some time and consulting with Hannah to get adjusted to it, but I like the Ferment Friend so much that I purchased a second one for my kombucha "batch". Thanks, Hannah!! I love this heater! it is very easy to put on your brewing jar and the best thing about it is that it shuts off when the temperature reaches the desired level so you save energy and don't ruin your kombucha! we use a woodstove in the winter periodically and sometimes it gets really hot in the house and my heater automatically stops heating. When we don't use the stove, I check my ferment friend and it's automatically heating away keeping my kombucha the perfect temp!! This is a quality product!! Highly Recommend!! I love this heater! So easy. Just set it and forget it until you're ready to bottle your kombucha. I had to pay constant attention to my batches until I got this. I even got one for my son and daughter-in-law who have just started brewing kombucha. My son says it's awesome! So glad to have a kombucha heater with a thermostat so I can set it and forget it! No worrying if the temp will drop too low or go too high. The pro-line that we have is a great size for our larger vessels. Looks much nicer than other heaters I've seen. This is a great little heater. I varies in temperature by about 2-3 degrees, but that has been no problem. Much better than the other two heaters that I have tried. Thanks!! Love the thermostat control on this that has made successful kombucha brewing a breeze! I've been brewing for about 6 months now, and the Ferment Friend has made my brewing and harvesting times very predictable, helping me easily work brewing into my busy life. I'm able to bottle 6-8 bottles every 3-4 days from our CB with the consistent temperatures and wonder if I could increase the output even more. Also, it's great to be able to leave on vacation and not worry about it at all! Highly recommend purchasing with the brewer for a nice discount. Living in Iowa where winters get cold, I knew the Ferment Friend would be necessary. I have it on now and it is wonderful for keeping a constant temperature in the brewer. I have bottles in the secondary fermentation stage snuggled up against it around the brewer and that works too. My Ferment Friend was delivered on Sept. 18th and it works great! I love being able to set the thermostat and leave it knowing it will remain at the right temperature. I would not be without this heater. We had a cooler summer and I was very thankful to have it in order to keep the brew at a set temperature. It is so easy to just walk by and adjust at a glance. I do not have long brew times thanks to this handy invention. Honestly, I love this heater for what it gives me in perfect brewing temperature! I have two gallon jars brewing & the fermenter friend keeps them both snug & warm together. I have much more confidence in brewing now with this heater & the temperature control:) Thanks so much! The Ferment Friend Heater with Thermostat gives me peace that I can set the temperature and let it provide the perfect brewing environment! I highly, highly recommend this heater and thermostat! I'm never concerned if my kombucha is at the right temperature - it always is! Just set it and forget it. Could't be easier. This has helped my batches be successful with my 2 gal vessels. Look forward to see how well it works once it gets colder. Easy set up. Love that I can set it and forget it! As a busy Mom of two sets of twins...First let me say I normally don't take/have the time to do product reviews. This Ferment Friend with thermostat control is AMAZING!! I could not be more pleased with a product, its worth every penny...and those really count in my household! Keeping healthy on a budget takes planning and initiative...THANKS for taking the guesswork out of "keeping our cute Scoby all snuggled and warm" (words of wisdom from my children) In this drafty old Minnesota farm kitchen we are brewing/growing up generations & traditions of LOVE! This is an extremely wise decision to purchase a high quality product....thanks again for helping us on our journey to good health...beautiful company!! Excellent product that keeps my brews in the perfect temperature range. Paired with Hannah's impeccable customer service, makes KT brewing an awesome experience! My normal house temperature is on the low side for brewing kombucha. It brews but very slowly. I ordered the Ferment Friend with thermostat control with my CB deluxe kit. It seems pricely but it is worth every penny. I just set it to 79 degrees. It heats and then turns off by itself. My kombucha is definitely brewing faster with the boost in temperature. I love how it just takes care of itself and it is one less thing for me to worry about. I love this product. I should have bought it sooner. I recommend you buying this product if you want a steady, constant supply of kombucha for your household. Love it!!! I love the heat strip with the setting regulator. It makes everything so much simpler. I have been using the above equipment for a while -- and it really helps because I do not have to worry about the right temperature being maintained. Although brewing kombucha is a relatively straight-forward process, keeping it warm enough (but not too hot, which can kill the scoby), especially during the New York winter, can be challenging -- and the machine completely resolved that issue. Totally worth the investment -- my kombucha (four jugs) has been growing very nicely with just the right taste. Worth the price because it really helps! I have mine wrapped around the ceramic CB vessel. I then put the KKamp cozy around the whole thing so that it would stay and hide the apparatus. I then velcro-ed the temperature control to the legs of the wooden stand and it all works so well together. I worry about my SCOBY much more than I do my Water Kefir Grains, so this helps tremendously with keeping the temps consistent. We are planning to go on vacation soon, and I will leave with not a second thought given to the CB vessel, as I know it will be well maintained with this heater strip. I needed the easiest and most low maintenance version of the heating strips, and after having it for 4 months now, the cost was part of the investment that has already paid itself back. We drink this lovely beverage daily! Thanks for sharing the love, KKamp! This product is amazing. It is exact and to the point. You can speed up your brew and slow it down depending on the exactness of the temperature control. Nice to get the consistency out of your brew. I LOVE the Kombucha Mamma Ferment Friend Heater with Thermostat! I would not be able to brew kombucha in the winter without it! It keeps my two, 1 gallon jars at a perfect 80 degrees, and was super easy to set up! Thank you so much for your wonderful Customer Service, and for helping me to brew my own kombucha!! When my kids get chilly I can tell them to put a sweater on, but keeping my Kombucha warm was a bit more difficult. I say "was" because the Ferment Friend has taken the stress out of my brewing! My daughter is drinking Kombucha to help her digestive issues so our ferment needs to be consistent. But with the cold winter temps, I was constantly adjusting the heating pad and stressing over whether this batch would turn out all right. But with the ferment Friend, I'm no longer stressed! And my brew is consistently delicious! I bought this heater after my first batch took more than 8 days to primary ferment. My house is in the high 60s. I was worried about mold growing and inconsistent brewing, so I decided to buy this heater. I am so glad that I did! It truly is set it and forget it and now my primary ferment is consistently done in 5 days! I purchased a 5 Gal Oak Barrel continuous brewer a few weeks ago. The KT is moving but too cold, always around 65 degrees. I have brewed both beer and KT in the past and have always wanted a simple to use fermentation heater to keep things humming along at the correct temp. Enter the Ferment Friend! Fantastic piece of equipment. I only had to add a blanket wrap to help keep the heat in and to make it more efficient. Love it! Thanks K Kamp! I am new to kombucha brewing and felt I need all the help I can get. I didn't want to have to worry about the temperature of the kombucha and this heater is the perfect solution. It works wonderful and I haven't had trouble with any of my batches. I would highly recommend it! I used to heat a small room to 80 degrees. This is MUCH better! It is a much more consistent temperature, never a worry about my Booch. I love this heater! I first purchased the basic strip heater which worked fine, but heated the batch too hot. Rather than play the guessing game I purchased this one and am SO happy. You can literally 'set-it-and-forget-it'! It keeps the brew at a steady temp, is very easy to use and a great product for the good price. I give your heating system a five out of five! It's made my brew more consistent and it's incredibly easy to use! I would recommend this to anyone who is brewing kombucha! The FERMENT FRIEND is the absolute BEST, perfect for the serious brewer. We have a 2.2 gallon stainless steel brewer and recently ordered it. The scoby is now BEAUTIFUL! Before, it was dark in some spots and pretty ugly, now it is a wonderful fresh looking cream color and is obviously much healthier by keeping it at an even temp. The brew is much tastier also. We are about to get our second FERMENT FRIEND, so we have one brewer working and the other we can draw from while we are waiting. I tried brewing with a seedling heating mat around my container, but never knew the exact temperature of my brew. My SCOBY didn't really grow significantly and my brew was always too sour. Then I let it dry out. I'm still pretty new to brewing, but I really like, being able to set the temperature to 82.3 degrees to start the process then lower it to slow the process down as it finishes. With the Ferment Friend I have much more control over the process. I love this heater. Living in OK the temp is always changing but this keeps my continuous brewer at the right temp all the time. Highly recommend it. 5 star for sure! I was having difficulty maintaining the temperature. So my Kombucha was not progressing how I wanted. Lacked the effervescence. The Ferment Friend was the answer. Great quick delivery as well. Great consistent heating. I snaked this around two one-gallon jars and narrowed my brew time by nearly a week. In Michigan's cold winters, I couldn't have asked for better results. Set it and forget it! Living in Montana, the winters and really most of the year, require a reliable heat source if kombucha is to be brewed. The "Ferment Freind Pro" is the answer. Where I brew, the ambient temperature hovers between 62° to 68°F. With this heater on a 2 1/2 gallon vessel, I am able to keep the temperature at a perfect 80°. I discovered by accident that the temperature controller is able to be calibrated and so was able to change the controller to match a reliable source, NOT the stick on thermometer. I will leave it to KKamp to provide instructions on how to calibrate thi unit. Overall, very pleased with everything KKamp. I'm a fairly new Jun brewer & recently purchased a continuous brewer, as well as the Ferment Friend. I promptly went on a 2 week vacation confident that my brew would remain at the correct temperature. I returned home to delicious Jun tea! It makes the brewing process so much easier when you don't have to constantly check the temperature of your brewer. If you live in a cold climate (as I do) I highly recommend it! When I started experimenting with making kombucha, I read everything I could online about the best/correct way to do it. I was pleased with my results, but stymied as to why some batches would turn out with paper thin scoby's and they be a dark brown sometimes. I naturally thought it was something I had done...but would come up empty with an explanation. My purchase of Hannah's book "The Big Book of Kombucha" was my first smart move and my second was buying her heating belt with digital thermometer. I just can't get over how great my last 2 batches have turned out. Scoby's are the thickness they should be and tea tastes great. I had been using the blue belt I ordered from Amazon and didn't realize how hot it was making the tea, which effected the scoby and the taste. When I got my new belt thermometer from Hannah, I followed the instructions and knew it was heating up, but couldn't figure out why when I put it on my crock, I didn't feel any heat coming from it and thought it was defective. When I called and talked to Hannah, she explained that's the way it works...felt like a dolt..lol...but, she couldn't have been sweeter and more helpful. Great, great customer service! If you're just starting out, do yourself a favor and get this or one of her other heating belts. You won't be sorry, especially when you have batch after successful batch. It's worth every penny! This winter I set-up a kombucha batch for my daughter at her house, so naturally, I needed to buy another Ferment Friend! It is so wonderful to be able to set the temp and not worry about the batches. This is a MUST heater to own. Brilliant! I ordered the Ferment Friend over Christmas after a friend gave me a SCOBY (he also gave me a taste of his kombucha a while ago and my body has been craving it since). I've bottled my first batch and my second batch is almost ready; I've begun to share it around and expose my coworkers, friends and family to its deliciousness. So far I have two people quite curious about the process. Spreading the word! I first got interested in kombucha when the library I work at, Fraser Valley Regional Library in southern BC, purchased your Big Book of Kombucha. They say don't judge a book by its cover but the cover did catch my eye. I've dabbled in other ferments and live on a hobby farm so I'm always looking to add another element to my homemade lifestyle. I flipped through the book and went home and ordered a copy. I read it cover to cover once it arrived, and sometimes I just carry it around to flip through on my breaks. The Ferment Friend has been essential to my kombucha as I live in a 100-year-old house with a wood stove for heating; the temperature fluctuates too much for a happy SCOBY at this time of year. I give it a five out of five, worth every penny, and it gives me a peace of mind that even if my fire burns low, my brew will keep going. So thank you all for your book, website and tools for kombucha, they are my go-to and the reason I'm brewing today! This product works great, it keeps the temp perfectly where I set it. I can leave it with confidence knowing it will be happy. Perfect solution for winter brewing here in the northeast. Thank you again! ferment friend seems to have been a necessary investment-it consistently maintains temperature without my intervention. My brew tastes so much better than commercial kombucha that I wouldn't want it to fail due to temperature. Over the summer I started making my own kombucha to satisfy my expensive addiction. It was working great, until fall/winter in Boston hit, and my house became too cold to keep the fermentation process going. After some research, I found out that kombucha should be brewed above 70 degrees Fahrenheit, ideally at 80 degrees. 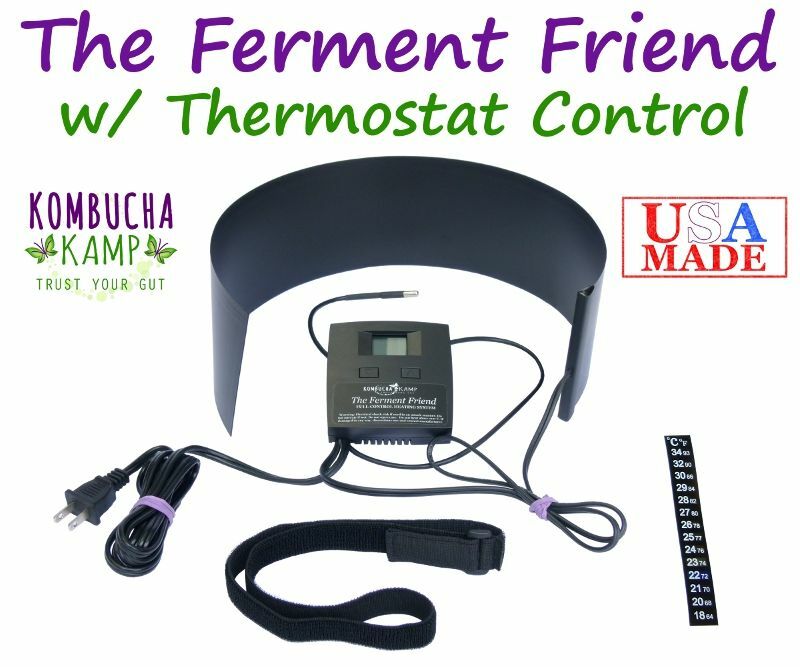 I looked at many kinds of heaters for my continuous-brew vat and decided on The Kombucha Mamma FERMENT FRIEND Heater with Thermostat. It was more expensive than most others, but I am too busy and forgetful to monitor the temperature every day, and this one makes it very easy to 'set it and forget it.' I just enter the temperature I want, and it continuously adjusts to keep a perfect brewing environment. I am getting amazing kombucha with it, more flavorful and faster than ever. It saved my brew!!! I would recommend this to anyone who wants great year-round kombucha--it pays for itself quickly if you drink it regularly. I ordered my ferment friend since I was starting my continuous brew in the late fall and I didn't want my batch to fail. I plugged it in, set the temp to 78 and have never touched it since! It keeps my brew within 1 degree of 78 with absolutely no attention on my part. I almost got one of the cheaper ones but I'm glad I didn't because I know I wouldn't have paid enough attention and I could have hurt my scoby's productivity! I purchased 2 of these for my two 2 1/2 gallon vessels. I have had them for over 2 months now and love them. My house temperature changes while these remain the same. They make brewing much easier ~ definitely worth the money! I am so thankful to have this heating system. I keep my house cool, so brewing takes so much longer without it. I just set it at the temperature I want and forget about it. I am very pleased with this purchase. i totally agree with Amy from MN. spend the money. get the best heater. set and forget but be sure to put that little probe next to the jar of booch - i put it between the 2 jars i have brewing. This heater is the cat's meow - we got the Pro Line and our batches are so consistent, you've got to buy this product. My arthritis has reduced greatly from drinking Kombucha. Smell is always constant - can smell that its ready!" I found, living in a colder climate, it was/is difficult to keep the brewer at a stable temperature. So, I ordered the Ferment Friend Thermostat Heating System a few days after starting up my brew. It came in record time and it has been AWESOME to no longer fret about dropping temps. I give the Thermostat heater system a thumbs up with 5 stars! I originally ordered the Ferment Friend. I brew four 1-gallon jars, and I found this wasn't big enough or long enough to really interweave around four jars. So I ordered the Pro Line, which is wider and longer. I like this much better, and have ordered a second one. It makes so much sense to have these heating systems, since temperature is so crucial to brewing success. Also, I was very, very pleased with how quickly the products were shipped. Love this heater because you set it and forget it! You gotta love the ease of it. I ordered the Ferment Friend heater with thermostat.The heater is easy to use and works exactly as described in the instructions. It arrived quickly, and the Kombucha Kamp team promptly replied to my email questions. Thank you! Here is my review for the Ferment Friend w / Thermostat Heating System I ordered from you. It has made all the difference in the world! The brewing time is less which we are delighted about, and the flavor seems better! The temperature is set and the brew is warm and cozy in the corner of my kitchen, so everyone is happy about the Heating mat. Just set it and forget it!!! Spend the money and forget about it. This heater makes keeping your brew at the perfect temp easy without thinking about it - which is great in Minnesota where winter is cold and long!!! I was very excited to start using these, I keep the heat around 68 in the cold winters here and the room I brew in can get down to 60 or cooler. I've already set them up on 2 continuous brew crocks and they are working fantastically!!! Not looking forward to winter but will have no problems brewing this year! Oh my stars, this is the Best and easiest heater Ever!! I live in the mountains where the evenings are quite cool and the days rather warm during the summer. This little baby does a Fantastic job of keeping the temperature even and I don't have to do a thing!!! I've had a different heating belt that I had to keep babysitting daily. Wasn't easy to use. With this ferment friendly system I literally walk away. I love it!! I Definitely recommend this to everyone! Thank you Hanna! The Ferment Friend's thermostat requires zero interaction once the target temp is set (a cinch! ), removing ambient temperature as a variable and affording a reliable brew schedule year-round. The Ferment Friend is dead-simple: it normally shows its thermometer probe's reading, so to set the temp just click the arrows and the display flashes the thermostat setting, so keep adjusting with the arrow buttons 'till your target temp is input. The probe you pin between the heat pad and the securing strap, so it just tucks under the strap to touch the outside of the pad. I love that the thermostat maintains the temp with ZERO further input from me, truly a set it and forget it system! This independence from ambient temp fluctuations makes the cost well worth it to me versus merely controlling heat output level and having to monitor and adjust it. The fact that it never deviates far from the target temp means it applies gentle heat often rather than blasting heat infrequently, perfect for keeping the microbes at optimal activity levels. It is extremely efficient and frugal in its use of electricity. I'd been having trouble with my kombucha taking a really long time to ferment, especially over the winter. I also rarely got much carbonation at all during the second fermentation. The heating system was easy to set up. I love that I don't have to adjust it and can see where the temperature is at a glance. My first batch was done much more quickly, and this was the first time I have had bottles erupt with carbonation like that. Love it. 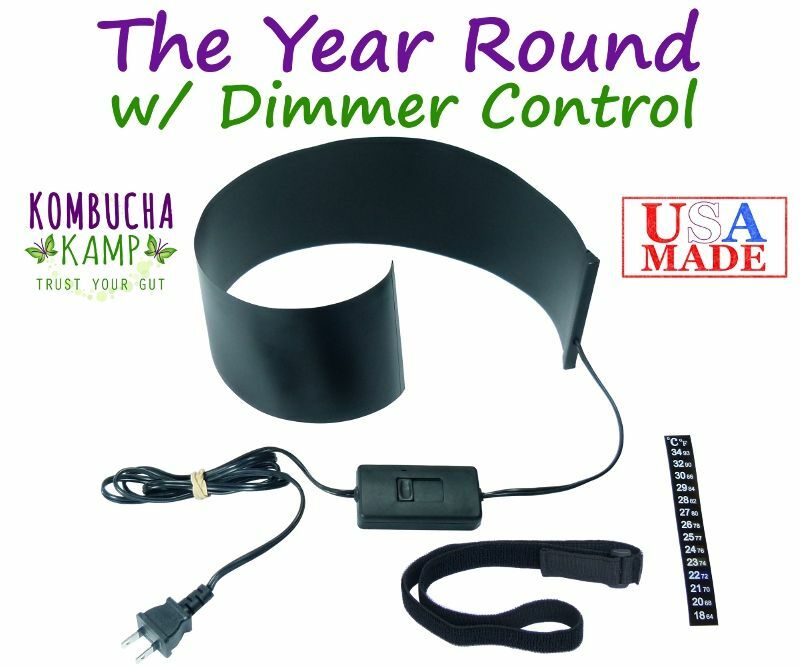 I purchased The Kombucha Mamma FERMENT FRIEND Heater with Thermostat. I simple love it as it has saved me a lot of time trying to watch the temp. Well worth the money spent. I had an issue with the first unit that I ordered, over heating my tea. Customer service was quick to respond and try to help me. Hannah even called to go over the problem with me. A second unit was sent and it is working perfectly. I appreciate the customer service I received and especially the fact that Hannah took the time to call me a couple of times to make sure that everything was to my satisfaction. Thanks to everyone at KombuchaKamp! I'm LOVING my Fermenting Friend! After spending months using the heater without the thermostat, I upgraded to this one, should have bought it in the first place. Works great, now I don't have to keep trying to fiddle with the old one to keep the temperature at the correct level. Recalibration was needed, but I love knowing my kombucha is at the correct temperature. I figure it pays off in the long run. Very easy to install and easier to use. I noticed that it indicated a different temperature than the strips I installed previously, so I tested it against my high quality cooking thermometer and the new unit was 2 degrees off. So I calibrated it (easy process) and all is very good now. Would highly recommend this unit. Hannah was a great support. This heating system is wonderful and makes continuous brewing a snap! No more fussing over the proper temp, literally set it and forget it! The yeast and bacteria work together like a well oiled machine producing delicious Kombucha batch after batch! I now have 2 CB's going and both are wearing a Ferment Friend. I am so pleased with this heat system!! I love this unit. I had read on several blogs that a heater would bring your brewing to the next level and it is definitely true. My kombucha is better tasting and more bubbly. It's taken some of the worry out of brewing for me (a new brewer). Well worth the investment; I highly recommend! I finally decided to buy this heater and it was the best decision I've made. Works flawlessly and my continuous brewer is going great now. Super fast shipping too. Wow...love Kombucha Kamp. They have spectactular customer service. I had a lower grade heater from them, but it wasn't working properly. I asked if I could pay upgrade fee to order this newer version, and they permitted the exchange. I am so delighted with this heater. It has provided perfect temperatures and made a HUGE difference in my brews. I have some severe temp changes throughout the year, but the heater has made all the difference in the world. The electronic thermometer is awseme since I don't have to stay on top of temp and make adjustments. Great little heater! So great to set the temperature and not worry about the kombucha temperature. I am using it to heat 3 two gallon batches by placing the heater between the bottles. It only covers about half of each bottle but works wonderfully and brews my continuous brew batches so much faster! Love it! Perfect brew every time. I love this heater. I set it at 80 and it keeps the brew between 79.6 and 80.1. We live in Ohio and our house is usually between 62 - 68 degrees. Proper placement of the probe and blanket is a bit tricky on a 1 gallon container because the blanket wraps completely around the jar. On initial set-up I wrapped it around and moved it as high up as I could to the top of the liquid line and I placed the probe toward the bottom of the brew container. The house went down to 60 that night and in the morning my heater strip was saying the brew was at 92 degrees while the heater said it was only 77. I moved the blanket down a bit to make room for the probe at the top of the brew and that solved the problem. My brew now stays at the same constant temp and I've been cranking out perfect batches every 7 days. I'm very happy that I upgraded my deluxe continuous brewer system with the Ferment Friend. It functions perfectly, just as described, and my Kombucha turned out wonderfully tart and fizzy. This has worked amazing. I am making the best kombucha ever and it is SO easy! I am new to home brewing and began with a continuous brew system. The ferment friend with thermostat is a MUST HAVE for the continuous brew system. My home is kept at 66-70 degrees (too cold for KT), so this heating system keeps my KT at a perfect 79 degrees. I love that I can adjust the temp when I add new tea to my continuous brew container because it drops the temp when adding new tea/sugar solution. My Kombucha is better than any store bought I have tasted. I am so glad I spent the few bucks extra for this heating system, it's well worth it for perfect KT! The new heater is wonderful! It was already preset and I just plugged it in and checked the heat strip. It stays at 79 to 80 degrees. Now I have the tiny bubbles in my kombucha and it tastes great! This heater is the reason I came to kk over other places to get started brewing. I dont trust myself to continually adjust a heating pad (I would totally forget) and it gets super cold in my house. My booch has constantly been at 79°F and ginestly delicious. Keeping the heat right seems to have helped produce an awesome flavor. Love this thing. This heater is great! It keeps my brew at the perfect temperature. No worries about the brewing system getting too hot or cold. I love it! This heater has been excellent at keeping my continuous brewer at the proper temperature for my kombucha. My house temperature varies a lot depending on the time of day, especially in winter, so the thermostat has kept my scoby happy in all sorts of weather. I can rely on having kombucha ready for bottling every week now, no more guessing. This heater is great! It really is easy to install and keeps the perfect temperature. My house is cold but my kombucha is perfect! It is well worth the price. The customer care wonderful!! This heater is perfect! With winter here I was having a very hard time controlling the temp of my brew. Now I set it and never worry about it. Definitely worth it! I received the heating strap and it keeps my Kombucha nice and warm. I don't worry about the mother scoby at all now. ...simply “set it and forget it”! Just started home brewing and having the ability to set the team and enjoy sampling along the process has proved to be consistent and beneficial to the overall experience. Excellent product and absolutely necessary to maintain the proper temperature since I keep the house at 68-70 degrees. Set and forget. Simple, easy, and effective. Thanks for all the help you have provided through your web site, videos, blog, and emails. I am now successfully brewing my kombucha and it's because I have had your help. I hesitated to spend the money on the heater, but after reading all the comments, I decided to splurge on the one with the thermostat. I live in Colorado and my house stays pretty cool in the winter. I cannot emphasize just how much that purchase was worth the money. Thanks for all your help! Works well but trying to configure the plastic wrap and wires around crock is clumsy.Keep working on design. Temperature gauge would be better if it had a light so you could see reading. So glad I ordered this. Not only does this heater fit our décor around it’s stainless crock but also fits our need. We travel during extended times off of a week or two, leaving our brew on its own; the Ferment Friend allows us to come back to a perfect bubbly batch. Besides, it gives me peace of mind. Despite being in San Diego, our house stays quite cool throughout the year. Keeping our booch at 79 seems to keep it happily fermenting the sugars and producing that yummy natural carbonation we all love. I own two of these bad boys and cannot tell you how amazing they are! Set it and forget it truly is the case! My booch is brewing perfectly now in my continuous brew system. Thanks Hannah! This heater is surprisingly unobtrusive on my ceramic 3-gal crock (for a black strappy contraption). It was easy to set up and set the thermostat. I was initially confused when the temperature seemed to be going down, but do not worry. The thermostat display does not start at your vessel's current starting temp and work up; it shows the numbers from the set "ideal" temp going back down to the current temp, and then rises slowly up to the set temp again. Given our cold New England climate (and house! ), I had to start using the thermometer in Sept to keep it in a nice upper-70s range. My kombucha's been bubbling away happily! These things are great since I have my brewers set up in my garage and the quartz heater I have only keeps the garage so warm. These ferment friends take up the slack keeping the Kombucha and Jun at the proper temps throughout the winter. I live in British Columbia and have a hubby who likes to turn down the heat at night. I have been brewing steadily for over two years and have danced with all kinds of heating inventions! THE BEST dollars I have spent are on The Ferment Friend! 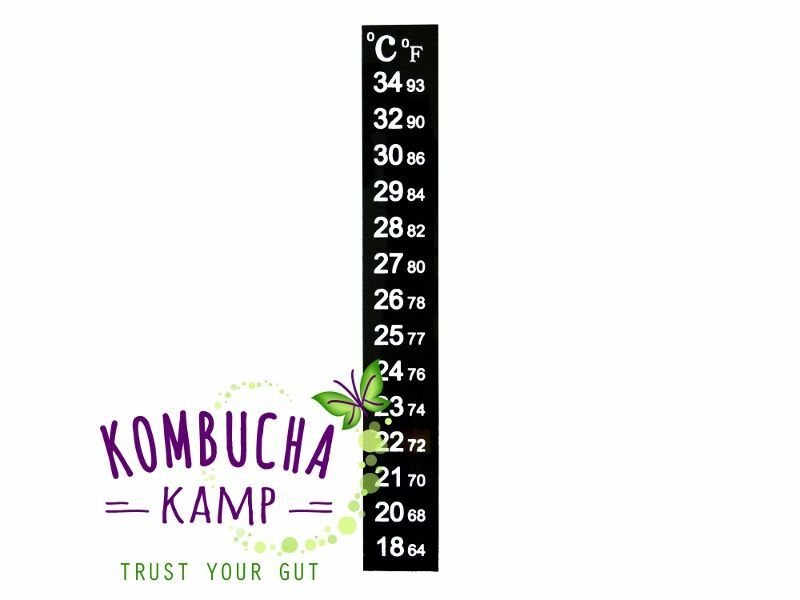 Constant temperature All The Time =Perfect Kombucha! And what did I do with my previous heater? Well, it now wraps itself around the bottles that are spending their three days in flavouring heaven (a flannel lined cardboard box)! Carbonation also helped with a little extra heat if you live in the North! Thanks, Hannah for the wonderful upgrade! This winter we started brewing kombucha and our house is not the optimal temperature for brewing. So, we started using an old heating pad to help keep our brewing system warm. We would turn it on when we were home in the evenings and on weekends. However, we did not trust it enough to keep it on all of the time. Also, we were not sure what temperature it was heating pad was making the container. It has been great to have the heating system. Now we are able to leave the system on all of the time and it keeps our brewing system within one degree of where we have it programed. We don’t have to worry about the brewing system getting too hot or being too cold. We leave it on all of the time and are pleased with the results we have had on our last few batches of kombucha.